ere is a book that fairly crackles with wit and wisdom, for six hundred years have not dimmed its ability to speak to our minds through the clarity of its perspective, the power of its language, and the vivid pertinence of its thought. Because of the genius shown in his lyrical works, Francesco Petrarca (1304-1374) inspired the Renaissance in Italy. He set patterns and standards for the revival of learning and, at the same time, was a powerful advocate for the preservation of valuable manuscript material. From the classic models, Petrarch transmitted a refinement of taste and thought, and a polish and politeness of speech and style. Petrarch's original manuscript, De remediis utriusque fortunae, or Remedies for Both Good and Bad Fortune, or Phisicke Against Fortune, is a work of prose consisting of two hundred and fifty-three dialogues that he completed near the end of his life. It represents a distillation of his moral philosophy arranged as a treatise that shows how our ideas and actions help us create either true happiness or sorrow and disillusionment. Throughout this long concatenation of dialogues Petrarch counsels modesty in prosperity and courage in adversity; he warns us against putting all our hope of happiness in mundane victories here on earth; instructs us on how to deal with our "Importunate Neighbours," tells us how to cope with "Loss of Time," and what to do when we experience "A Disagreeably Wavering Mind." For Foolscap Press the most difficult choice has been to select from the entire range of Petrarch's dialogues the forty-six that make up this edition. Lewis W. Spitz, William R. Kenan, Jr. University Professor, Professor of history at Stanford University, brings his considerable scholarship to the question of Petrarch's influence on the northern Renaissance, as well as providing an overview of Petrarch's written works. Through background and example he shows why Phisicke Against Fortune is, as he says, "a mirror for mankind." Hans Weiditz (c.1495-c.1536) was an important member of the small group of outstanding woodcut designers of the German Renaissance whose membership included Albrect D'rer, Hans Holbein, and Hans Burgkmair. The fact that he was nearly alone in illustrating a great number of secular books makes him in many ways a more interesting artist than his more famous colleagues. Weiditz is best known for his illustrations for "Brunfels' Herbal," which is recognized as the most important herbal of the period and the first botanical book to contain realistic and accurate illustrations. Weiditz's imagination and close observation of real life show most clearly in this herbal and in his handling of the woodcuts for the dialogues of Petrarch. 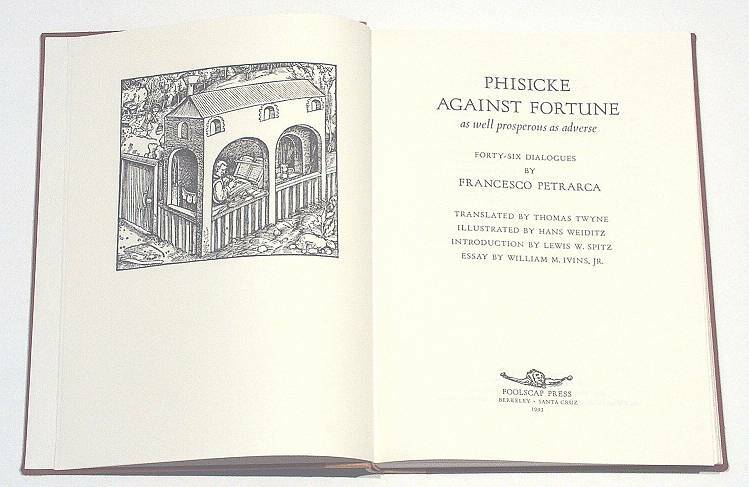 In illustrating Phisicke Against Fortune Weiditz demonstrates his highly individualized style and addresses an astounding range of issues, among which are: an individual's relationship to society; secular versus religious perspective; how we perceive and respond to nature and natural laws; and how we behave toward each other. As an appendix to the text we have included notes on the Weiditz illustrations based on information from Walther Scheidig and translated especially for this edition from the German by Beate Reid. Essay by William M. Ivins, Jr. In his essay on Hans Weiditz, William M. Ivins, Jr. (1881-1961), former Curator of Prints at the Museum of Modern Art, shares his infectious enthusiasm for the artist whose life had remained largely unappreciated until modern scholarship brought to light his great contribution to German Renaissance art. The Elizabethan Age was great both for the depth of its literature and the translations into English of many foreign works. 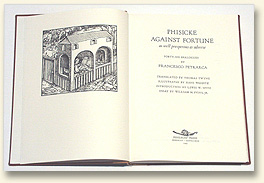 Thomas Twyne's translation of Phisicke Against Fortune, from Latin into English, was completed in 1579. Now, newly transcribed from the Elizabethan blackletter, with the spelling and punctuation standardized, Twyne's translation can be clearly enjoyed. We have retained intact the particular character of the work and the marvelous flavor of the language. 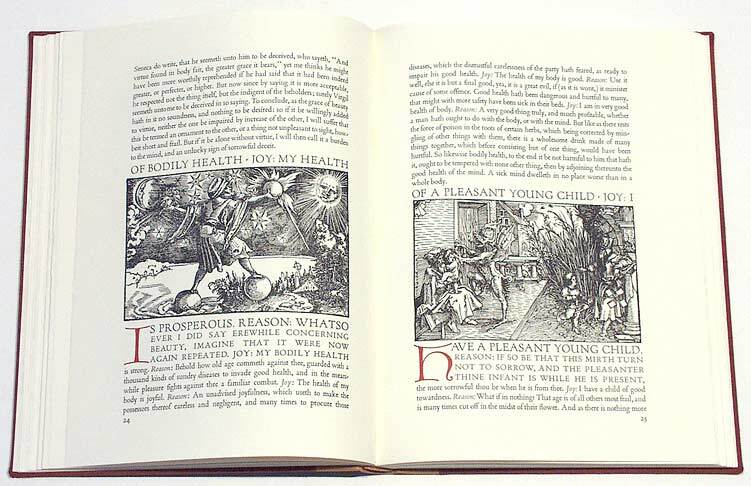 This edition brings together for the first time Thomas Twyne's translation of Phisicke Against Fortune and Hans Weiditz's wonderful woodcut illustrations which were made for the German edition of 1532. 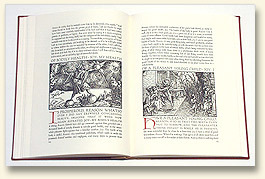 The original German edition contained two hundred and sixty-one woodcuts illustrating all of Petrarch's dialogues. We have selected forty-six dialogues that represent the enduring wisdom of Petrarch and the impressive imagery of Hans Weiditz. Limited to 175 copies, each book measures 12 x 9 inches and consists of 160 pages printed letterpress on Lana Royal, a mould-made paper from France. The text was set in Monotype as well as handset type using Poliphilus, Bembo Italic and Forum, with Calligraph Initials printed in red. 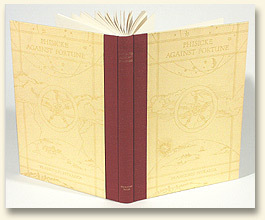 135 copies are hand-sewn and the rounded spine is covered in red Japanese cloth and is stamped in gold. Printed paper sides cover the boards. 40 copies are specially bound in quarter goatskin and red Japanese cloth and come in a slipcase covered in cloth and printed paper sides. The price is $285. 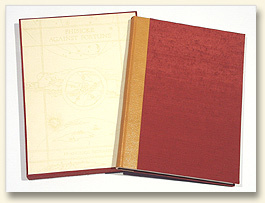 The 40 copies bound in quarter leather with slipcase are $400. 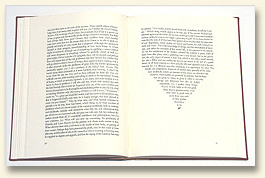 A few copies are held in sheets for bookbinders, at $257.